Gubernatorial candidate Kevin Stitt speaks at a forum hosted by the Oklahoma State School Boards Association in Oklahoma City in August. This is an updated version of a story published before the Nov. 6 election. For the first time in a generation, Oklahoma’s incoming governor won’t be coming into office directly from another elected office, meaning Gov.-elect Kevin Stitt could have to separate himself from business and financial arrangements before taking office. The separation – a kind of divestiture, which typically refers only to the sell-off of business assets or holdings – doesn’t have any defined steps and is not specifically required under state ethics rules. But ethics laws apply when candidates and spouses’ investments, business relationships and ownership of companies pose potential conflicts of interest in which the officeholder or family members would benefit personally from official acts or decisions. Even the appearance of a conflict could raise political issues. And divestment can be a gray area, with debate arising over the degree of separation. 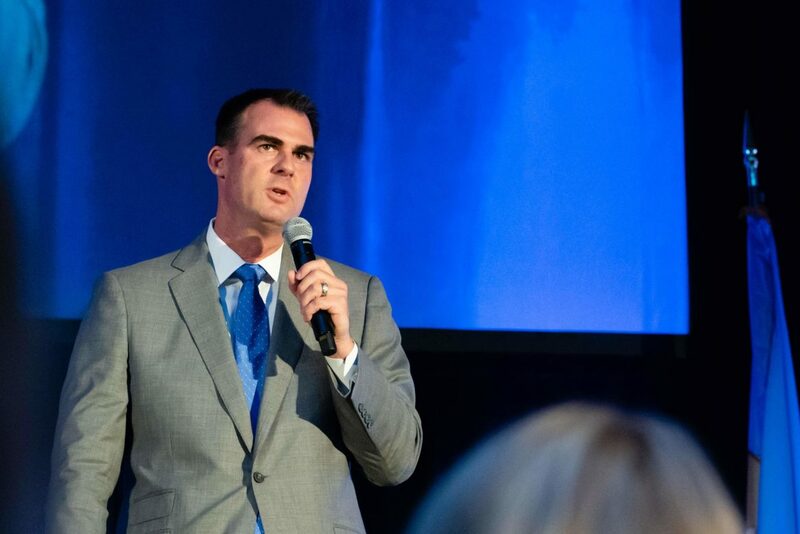 As governor, Stitt will have the authority to appoint boards, commissions and some agency heads and sign or veto legislation, some of which could have dramatic effects on his business interests. Stitt, a Tulsa businessman who founded Gateway Mortgage Group in 2000, defeated Democrat Drew Edmondson and Libertarian Chris Powell in the Nov. 6 election. Former Gov. Frank Keating, who was elected to the first of two terms in 1994, was the last governor who came from private life – working only in the private sector – immediately before he won office. Even then, Keating had been an FBI agent, state lawmaker and an associate attorney general in the Reagan administration before a brief stint in private life. He was deputy secretary for the Department of Housing and Urban Development until early 1993. Outgoing Gov. Mary Fallin was elected in 2010 and came from a seat in Congress. But she faced questions about her husband’s work as a workers’ compensation attorney. Fallin sought an attorney general’s opinion and advice from the state Ethics Commission, both of which cleared Wade Christensen to keep practicing in that area. However, he voluntarily agreed in 2014 not to take cases before the new Workers Compensation Commission, formed under a key policy change pursued by Fallin and Republican legislators. Stitt will have to file a personal financial disclosure statement with the state Ethics Commission within 30 days of taking office on Jan. 14. All material sources of income or ownership stakes above a certain threshold have to be disclosed. The state disclosure form is less detailed than those used for federal positions and congressional office and doesn’t require assets to be disclosed. In July, Oklahoma Watch requested financial information and tax returns from all candidates for statewide office. Unlike his two opponents in the gubernatorial race, Stitt declined to release any financial details or returns. Stitt could have a complicated road to divestiture. He has grown Jenks-based Gateway Mortgage Group to more than 1,200 employees with operations in 40 states. Oklahoma has not had a governor who has come directly from owning and running a company of Gateway’s size. One of the closest examples is former Gov. Robert S. Kerr, who came from a thriving oil and gas company, which later became the Kerr-McGee Corp., to win the governorship in 1942. Stitt stepped down as CEO of Gateway on Aug. 1 but remains as chairman of the board. A week later, Gateway said its owner, a private trust comprised of Stitt, his wife and children, will acquire a Cherokee-based bank, Farmers Exchange Bank. The transaction will fold Gateway into the existing regulatory structure of the state-chartered community bank, with the new company to be called Gateway First Bank. The Gateway bank conversion is pending before the Oklahoma Banking Department and the Federal Deposit Insurance Corp. and is expected to close in the first quarter of 2019, said Gateway CEO Stephen Curry. The new bank would be among the state’s top five banks in terms of employees and net income, Gateway said in a press release announcing the deal. Should the Gateway merger gain approval, Stitt could be in the unique position of picking the people who will regulate his bank. The banking commissioner and members of the seven-person Banking Board are appointed by the governor with the consent of the Oklahoma Senate. Four of the seven members of the board have their terms expiring during the next four years. “We are working on a comprehensive solution and will seek the guidance of the attorney general through the process,” Stitt spokeswoman Donelle Harder said Monday. In an earlier statement to Oklahoma Watch, Curry said oversight and examination of state-chartered banks switches from year to year, with the state leading it one year and the FDIC or Federal Reserve leading it the next. For larger institutions like Gateway, both the state and FDIC are represented, he said. A similar situation would have arisen had Gateway remained a mortgage company and been regulated by the Oklahoma Department of Consumer Credit. That department’s 10-member oversight commission is also appointed by the governor. Seven of those commissioners have terms that expire in the next four years. The founders of Epic Virtual Charter School donated at least $145,000 total to dozens of candidates in this year’s elections. The donations outpaced those from the Oklahoma Education Association PAC and have come amid continuing dramatic growth in enrollment at the online school.